This will be an upgrade from my 34g solana. 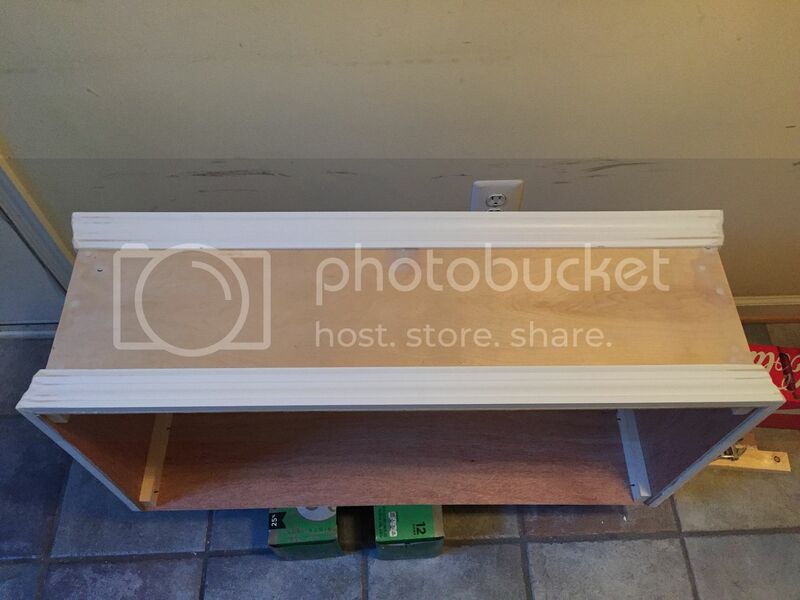 Dimensions are 36"L x 18"W x 21" T.
I plan on running both holes as drains and my return will be run thought the top. 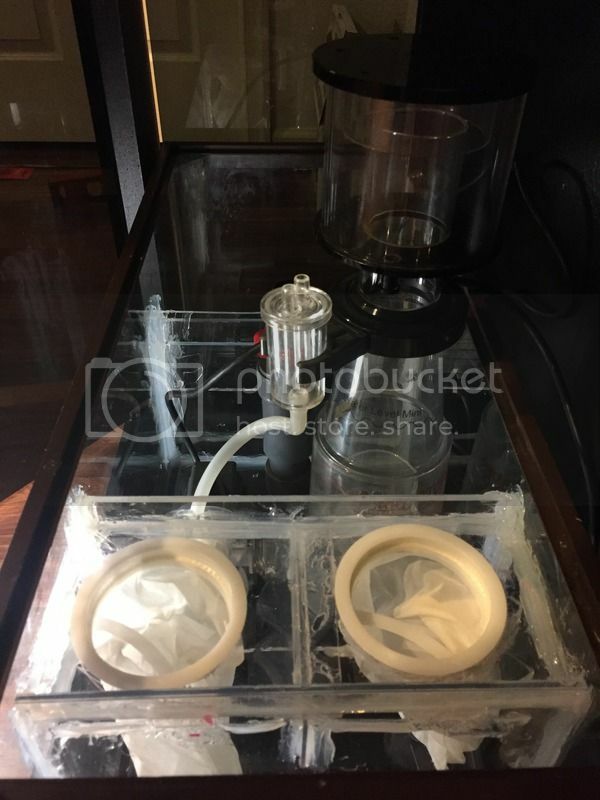 I plan on using the smaller hole as a durso full siphon and the bigger hole for the secondary/backup. 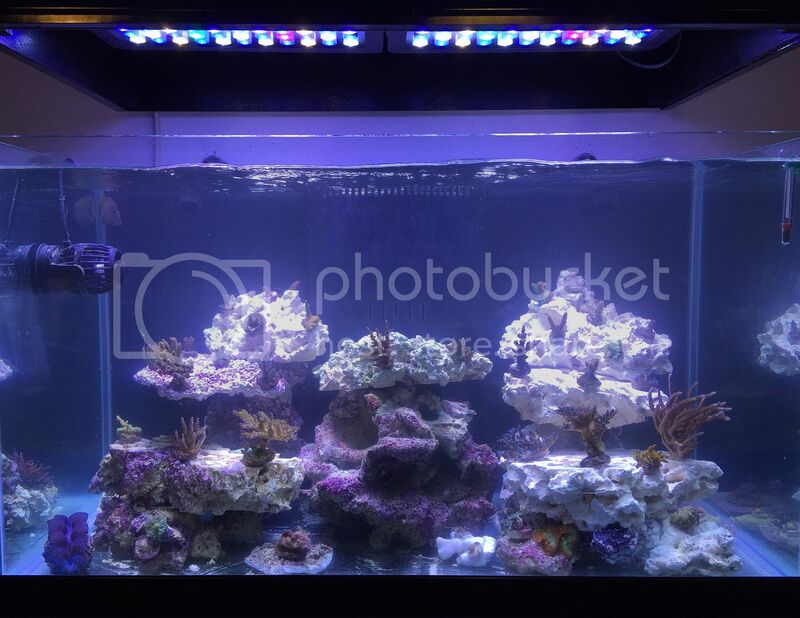 I want to run LEDs in the summer and MH/T5 in the winter to control temps/bills. So essentially a herbie drain system? Will it be as quiet as a bean? 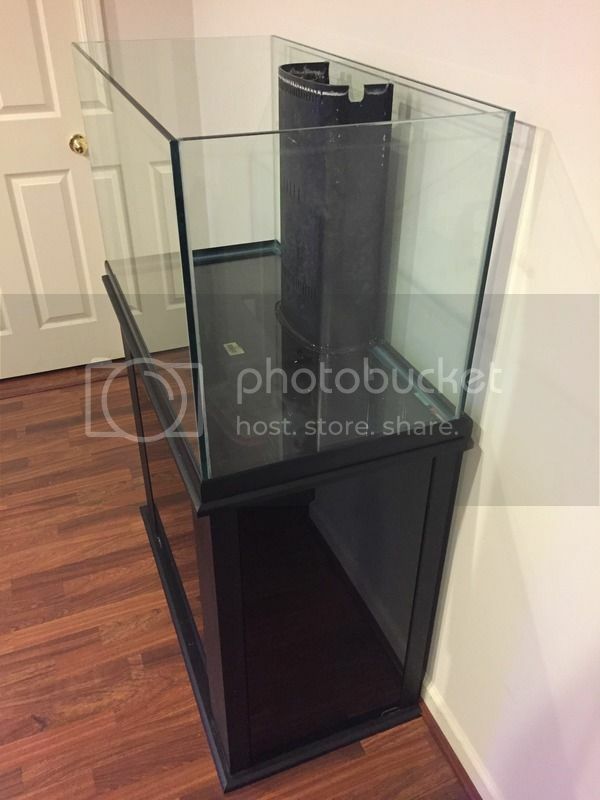 I have been considering this tank since it has the same dimensions as a 40 g breeder I think. Also, did you not consider drilling your return? I think I would. 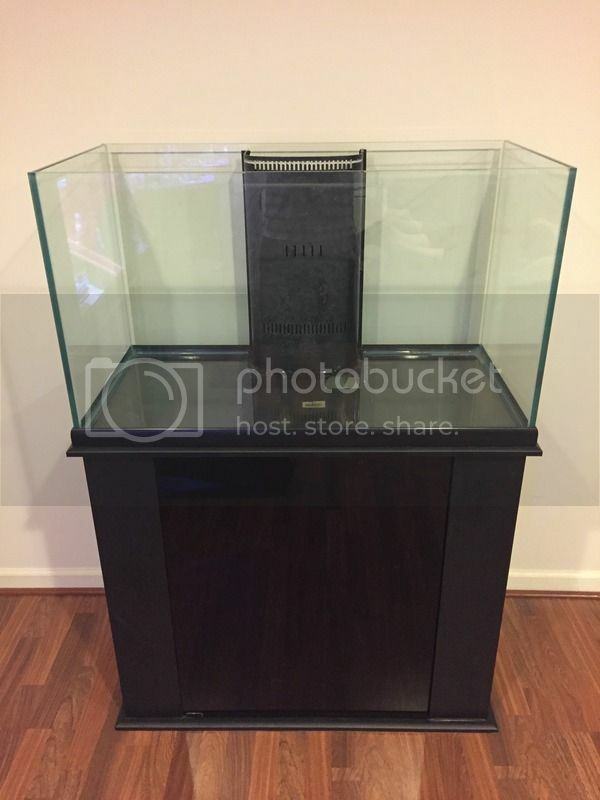 What is stopping me from buying the tank is a lack of 3 drain holes and no returns. I believe so??? I want it to be as quiet as possible. The dimensions are similar to the 40b plus a little bit of height. 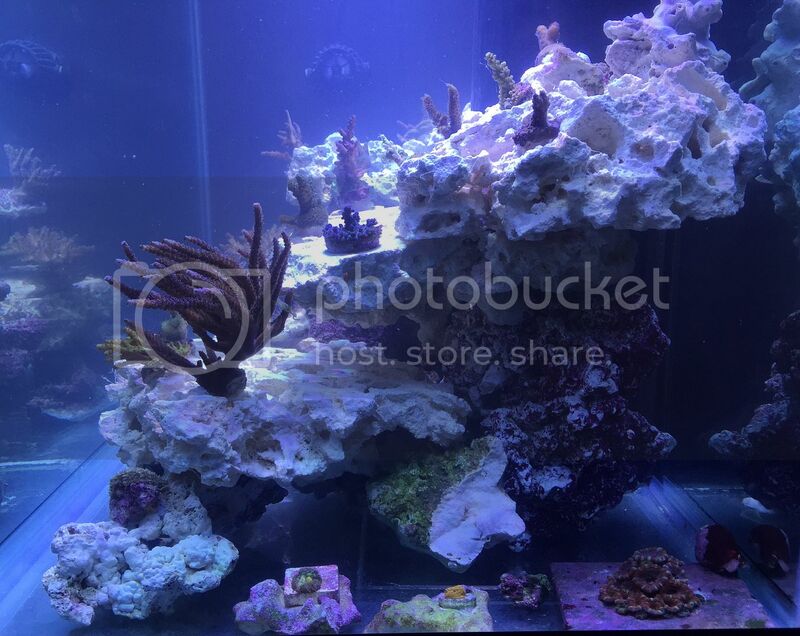 I was considering drilling the retuns but I want to keep the tank as close as possible to the wall to not take up too much space. Yea. I know what u mean about space. 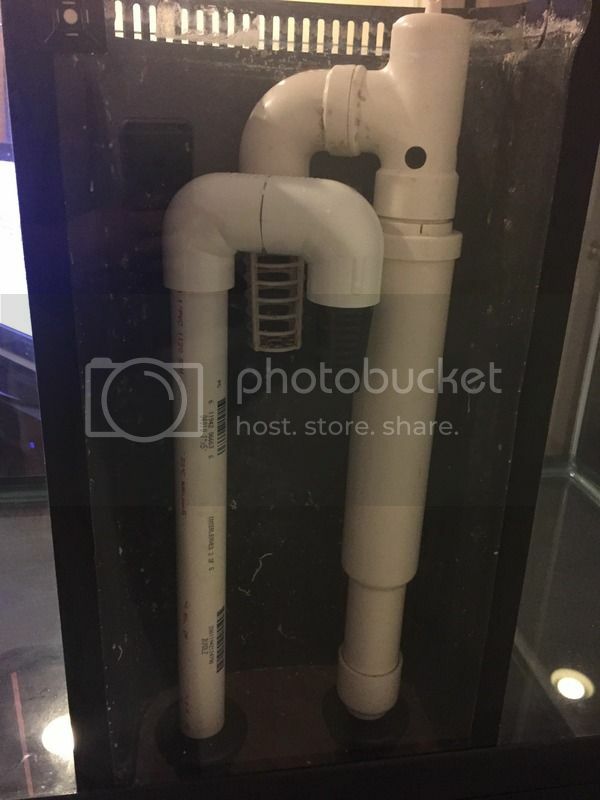 Sometimes the plumbing cases the tank to stick out 6+ inches. 3 holes in that overflow box would be perfect for you. With the return though you can use a 90 degree elbow and not lose much space when talking returns. I will be watching. Thanks for posting. 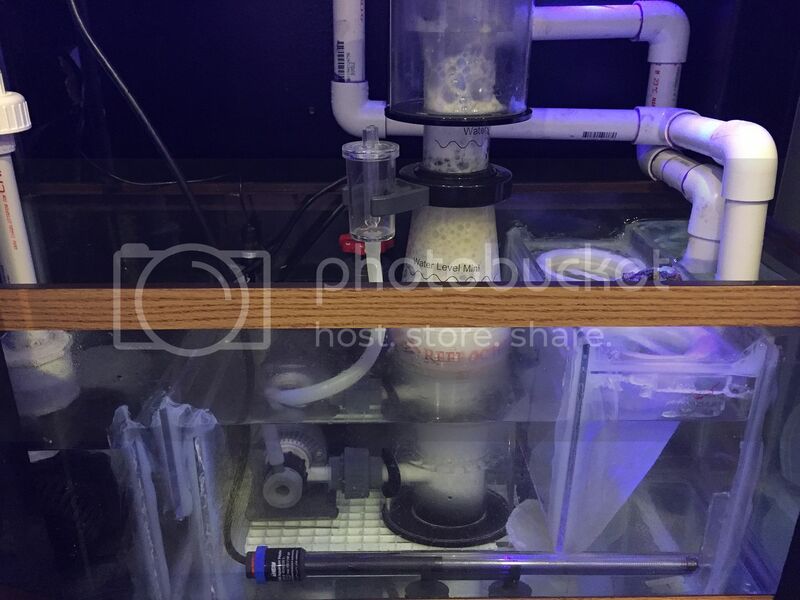 What kind of sump is under there? I bought a 20 gallon long today at petco for 20 bucks. I will make a sump. I'm not sure if any of the big mainstream off the shelf tanks have three holes in their overflows. It would be ideal that's for sure. I have a spare 20g long in my garage. I will dig it out tomorrow and see if it fits. Is petco doing the $1/gallon sale now? 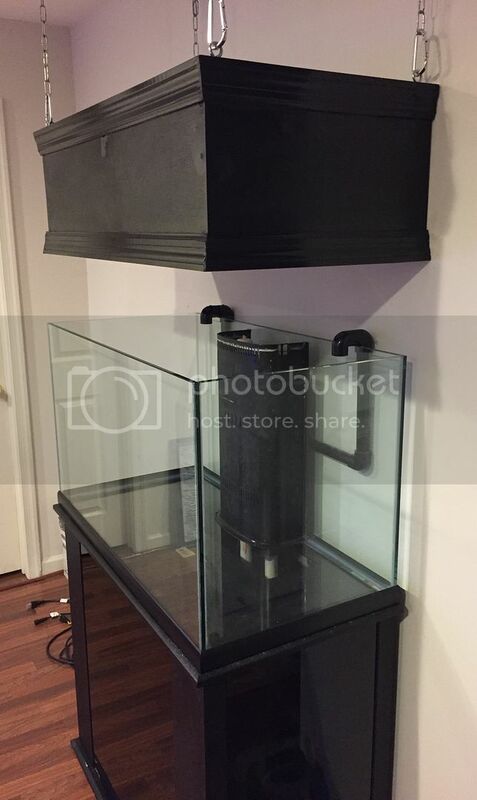 My original plan was buying a 40b and drilling the bottom and making a custom overflow but couldn't pass on this deal. And it will also save me tons of time. Yes. Petco is having the 1 dollar a gallon sale. And yes... I have a 40b sitting on my stand as I type this and I am not sure I want to invest in drill bits for a 40b. Now that 57 I would consider it. 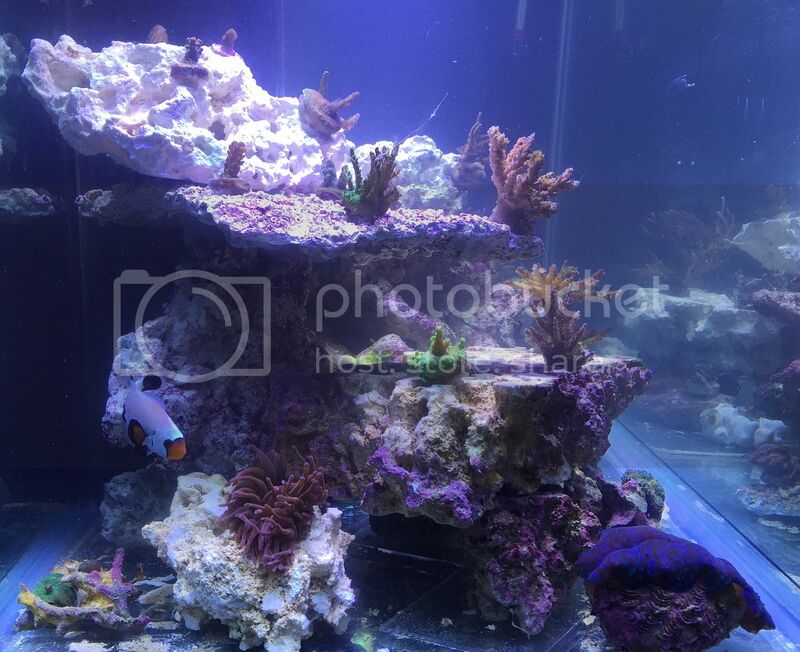 Nice looking tank. Overflow is a bit big but I could live with it. Problem is the holes already drilled. I need to see it in person again. I finally found some time to finish the sump. I copied the design off of exotic marines. 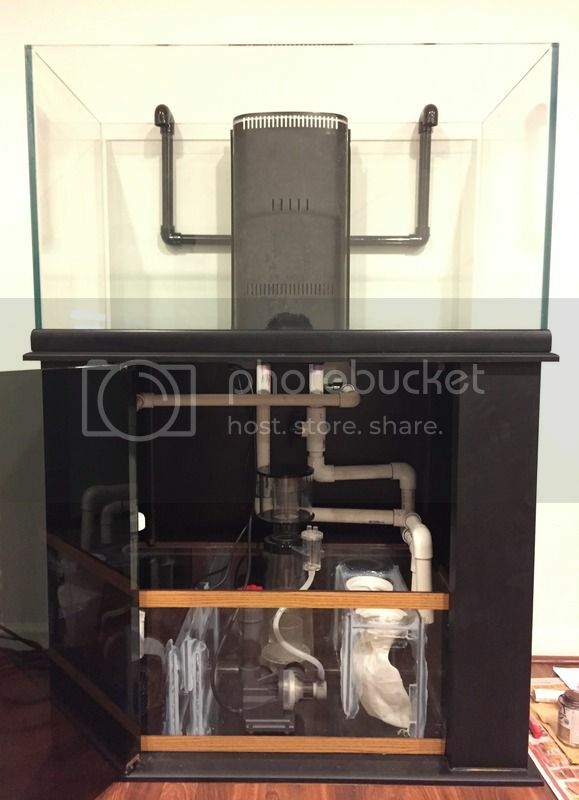 Going to do some plumbing this weekend and hopefully start filling it next week. 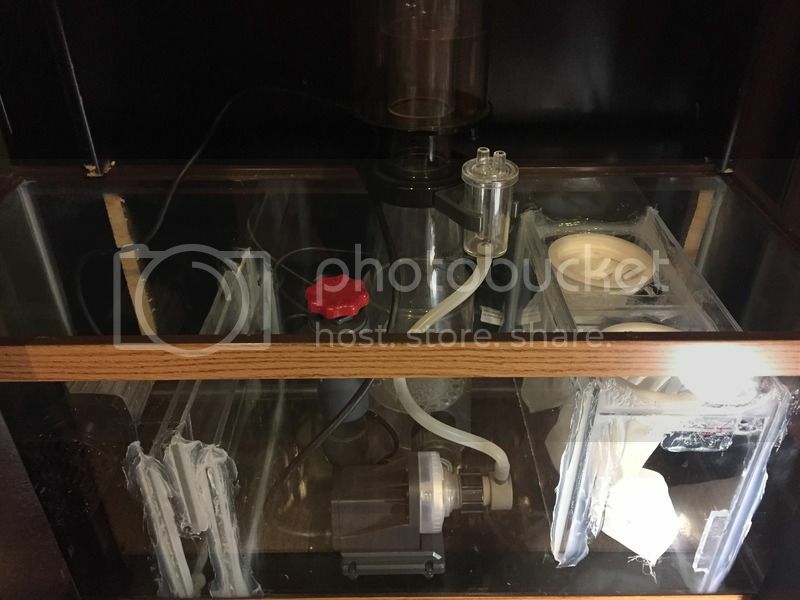 What did you use for a return pump? 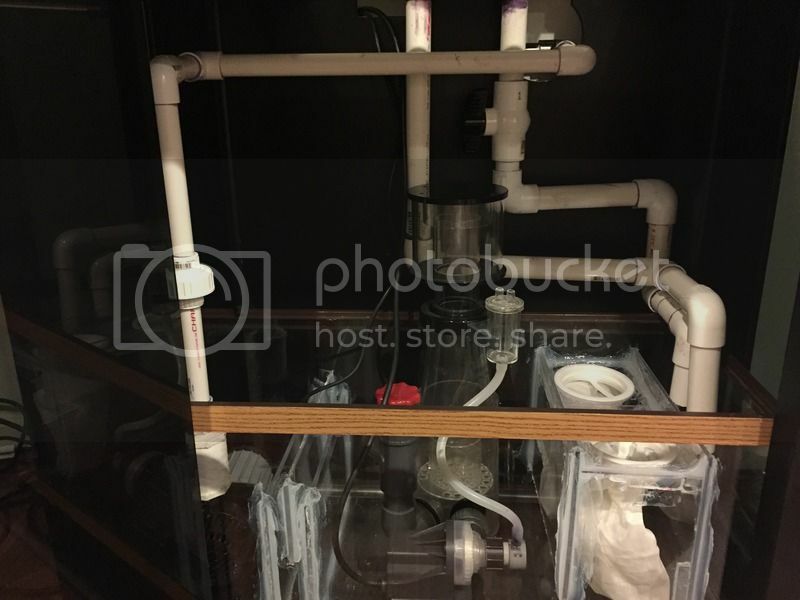 Maybe it is the pics but shouldn't the 2 drains flow into the filter socks? Or does it overflow into the socks? Return is a jebao 12000. The drains dump into the far right chamber and overflows into the socks. Once u turn on the return can u tell me how loud it is? As in the pump itself, not the water flow. sure is a lot of 90s in your plumbing though. but sometimes that's what we got to do the eh? I am sure you thought about head loss etc. with them. I almost went with this tank..i'll be fallowing along. I put extra 90s on purpose to slow down the return. I have a dc12000 from an old tank and don't want to buy another one. We'll see how it turns out soon. I built a canopy for it. It took longer than expected. I'm going to paint it tomorrow after work and hang it before the weekend. Nice. Congrats. I'm looking forward to it. The return pump is dead quiet. It has plenty of flow on the lowest setting. The water in the sock section is kinda loud. I'm going to have to make a muffler with the circle cutouts. I'm still trying to dial in the skimmer. I am still considering if I want bare bottom or not. Hmm. Do those leds kinda have a spotlight look to them? I wouldn't call it spotlighting. It's kinda washed out with a lot of blue. I'm still letting them adjust coming from MH. I may get some used radions in the near future. I'm also looking to add an mp10. I am not sure if mp10s are even worth it. I have two sitting in a box as I type this. Not really thrilled with them. I retested them a month ago in a 10 gallon and on high I was like expecting water splashing. Of course one has a bad bearing and is squealing louder then the other. Neat toy but I am still thinking a gyre or just good old reliable powerheads. Oh yeah? Ok thanks for the heads up. I've used a gyre 150 and I didn't really like it. It was way too loud. I'm currently using a rw-4 and it's a beast. I might just get another one for the other side. looking good man! only suggestion I have is replace the floating canopy hardware with something more elegant. like rubber coated steel wire and ditch the carabeaners. just a suggestion tho... I have always loved floating canopies. Thanks man. I was thinking the same thing about the hardware. It's kind of an eye sore. It definitely doesn't go with the flow with rest of the setup. I will look into the rubberized wiring. Thanks.